This is a great web part that someone at my company shared that I think your readers would really find useful. 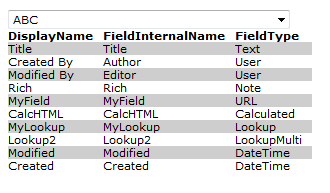 It provides a dropdown menu to choose a list in your site and upon selection displays the field name as next to the filed internal name for all fields in the list. The only thing I have changed is the style of the table to “width:auto”, so all credit goes to Ed and his colleague. Copy/paste, worked as advertised – 5 stars! Thanks to George Franklin for sharing this with us at our company. Hope you don’t mind me passing it on. Note – if you change the siteVar declaration (line 6) to remove the “http:” (so it begins “var siteURL = ‘//’ + …”), it’ll be a more robust script (i.e. it won’t fail on https: sites). Great script Ed, and thank you Alex for all of your clever innovation!